Purplebricks are delighted to offer this 3 bedroom Townhouse located within a exclusive gated development with has enviable River views, as well as a view of the Evesham bell tower. Benefitting from a larger than average garage with useful workshop and being ideally situated within the town centre for great access to amenities. The property is offered to the market CHAIN FREE. Located within one of the premium positions on the development, being directly on the waterfront with an uninterrupted view of the river, to the front on the property is an equally uninterrupted view of the Evesham bell tower. As you approach the property you will find a generously sized garage with a river view workshop. To the first floor of the property you will find a good sized lounge/diner perfect for those who like to entertain, with double doors opening on to the balcony which overlooks the river. To the front of the property, overlooking the Evesham bell tower you have the kitchen. The first floor has two of the three bedrooms and a modern family bathroom. The 2nd floor of the property houses the master bedroom as well as its own WC. The property further benefits from having a high quality finish throughout, communal gardens and gas central heating. The development also allows direct access to the riverside park. 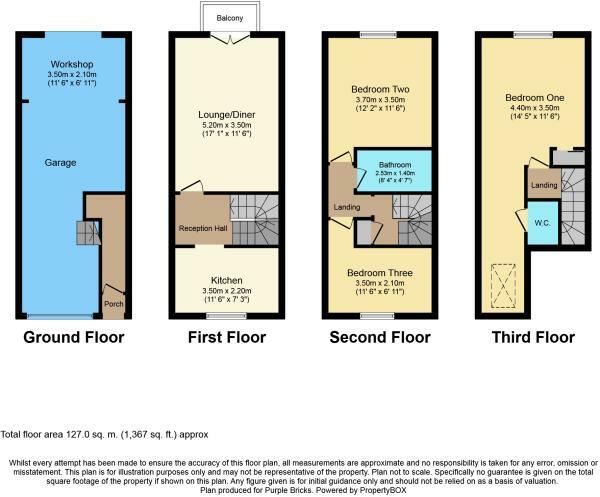 The property is conveniently located within close proximity from the Evesham town centre. Evesham town centre which has a wide range of amenities including banks, supermarkets, post office, bars, eateries, schools for all ages and much more. Evesham has a direct train line to London and easy access to the motorway. Disclaimer - Property reference 526467-1. The information displayed about this property comprises a property advertisement. Rightmove.co.uk makes no warranty as to the accuracy or completeness of the advertisement or any linked or associated information, and Rightmove has no control over the content. This property advertisement does not constitute property particulars. The information is provided and maintained by Purplebricks, covering Central England. Please contact the selling agent or developer directly to obtain any information which may be available under the terms of The Energy Performance of Buildings (Certificates and Inspections) (England and Wales) Regulations 2007 or the Home Report if in relation to a residential property in Scotland.